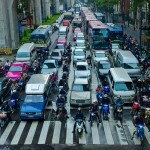 This is a list of motorcycle riding tips that may assist you when riding in traffic. It is the result of decades of riding a motorcycle and the experience gathered through these years. 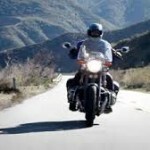 It is certainly not an exhaustive list, as becoming a safe, skilled and trouble-free rider requires learning many different tips and techniques over time. Our purpose is to pass on information that may assist you develop an attitude encompassing safety and survival while enjoying the sport of motorcycling. 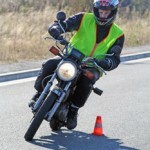 Enrolling in a motorcycle safety riding course will increase your knowledge and awareness, ultimately helping to decrease your chances of becoming involved in a motorcycle accident. Whether you are a novice rider or have several years of experience under your belt, we recommend you take a riding course. 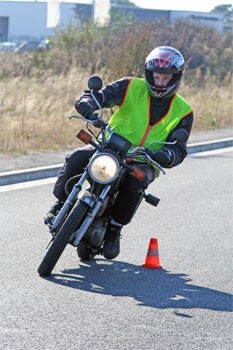 Novice riders will learn the basics of acceleration, braking and counter steering. They will also learn about different traffic environments and how to choose the safest lane position on the road. Experienced riders are given an opportunity to brush up on old skills while learning new ones. On-going training and practice sharpens our skills and promotes an attitude that will keep us safe. 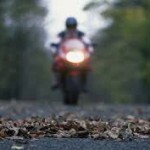 The primary concern for all motorcyclists is visibility. Statistics suggest that a large portion of motorcycle accidents happen because car drivers were unable to see the motorcycle prior tocollision. For this purpose, we need to consider our environment in relation to our lane position, the curves and hills in the road, the road surface itself, the weather, blind spots, other vehicles, our machines and our abilities. Our lane position will vary with the traffic around us, our own visibility, our intended route of travel, the condition of the road and even the weather. As traffic is always moving, we must constantly assess our position and try to keep a cushion of air between us and other vehicles. 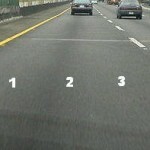 We can begin by dividing our lane into three sub lanes: Position One, Position Two and Position Three. Position One is the left side of the middle of the lane, Position Two is the middle of the lane and Position Three is the right side of the middle of the lane. 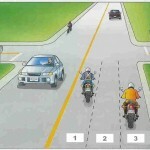 Generally, Position One (left side of the middle lane) is the best position in which to ride. This position promotes our visibility on the road permitting other motorists to see us. In this position, we are riding directly in line with the drivers of cars ahead and behind. They should be able to see us easily, giving us the cushion we require. This position also stakes our claim to the lane and prevents other motorists from using part of our lane if they pass. Our mirrors are best aligned to view traffic around us from this position and it is likely to be the part of the road with the least debris. This position is also the best choice when making a left turn. When there is a lane to our left with traffic traveling in the same direction, it may be prudent to move into Position Two (middle of the lane) when we pass traffic, or if traffic is either passing us or maintaining the same speed as we are traveling. If the lane to our left governs oncoming traffic, we can move into Position Two when cars and trucks traveling in the opposite direction pass by. This action maintains our cushion of air and reduces any risk of colliding with these vehicles. However, we have to remember that in Position Two we are riding over oil that has dripped from vehicles, which may be a hazard. While this is not always a problem on a sunny day, water on a rainy day can bead on the oil and become slippery. It is advisable to use caution in Position Two when it is raining and we need to accelerate, brake or turn in a curve. If there is more than one lane traveling in the same direction and we are not in the curb lane, Position Three (right side of the middle lane) can offer similar advantages as Position One. We will have greater visibility ahead and our mirrors will be aligned for traffic behind. If there is only one lane moving in our direction, however, we must remember that we are less visible in Position Three to cars pulling out from the right. We are also closer to parked cars and must watch for doors opening. This position may encourage overtaking vehicles to pass on our left while sharing the lane. This position is the best choice for making a right turn. 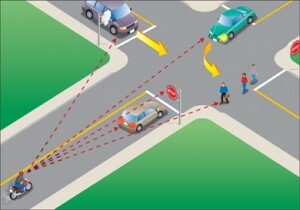 The majority of accidents involving cars and motorcycles occur at intersections. 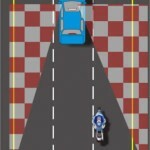 Often, the car and motorcycle are traveling toward one another when the car driver fails to see the motorcycle and turns left, causing the motorcycle to collide head-on with the car. To avoid this type of accident, we should roll off the throttle and cover our brakes as we approach an intersection. Look for the traffic lights and other control devices to predict traffic movement and watch out for cars waiting to turn left. As you get closer, move to Position Two or Position Three. This increases the space between you and any left-turning vehicle. It will also increase our ability to see further down the road and increase our visibility to traffic potentially turning left. We should also pay special attention approaching an intersection when in the right lane of two lanes heading in the same direction. If there is a car ahead in the lane to the left heading in our direction and it stops to turn left, it may block the view of oncoming drivers waiting to turn left, preventing them from seeing us. Also, the stopped car will block our vision preventing us from seeing the oncoming car. The oncoming car will not see us until we emerge from the blind spot and often this is only after the oncoming car turning left has already committed to making the left turn. It is advisable to proceed cautiously and move to Position Two or Three while approaching the intersection and resume Position One after passing through safely. Another potential hazard facing motorcyclists approaching an intersection with the right-of-way are vehicles that run the red light or stop sign and broadside the rider. It is always advisable to roll off the throttle and scan all roads leading into the intersection for potential hazards. When stopping at an intersection, do not pull up immediately behind the vehicle in front. Instead, leave enough room to move around that vehicle if required. Creating a space allows room to move and prevent being rear-ended if the motorist behind fails to stop. If other vehicles do not stop behind you, watch your mirrors and do not disengage the clutch. Stay in gear and be ready to move forward to avoid being rear-ended. While stopped, watch your mirrors until you have two or three cars stopped behind you. They will act as a cushion protecting you if another motorist fails to stop. When departing from an intersection, particularly after a red light, look both ways before moving forward. A common cause of accidents is motorists running yellow or red lights. The extra second may prevent you from being hit by an impatient driver running the light. A ‘blind spot’ is the area around a car or truck where the operator is not able to see when looking directly outside the vehicle or when using the mirrors. Typically, this is the area toward the back of the car or truck. Often, the larger the vehicle the larger the driver’s blind spot. To ensure we are not riding in the blind spot of the vehicles next to us, we should look for the operator’s face in one of the mirrors. If we cannot see them, it may be likely that they cannot see us. While it is advisable not to travel beside a car or truck for any distance, if the situation requires it, we need to avoid being caught in a blind spot in the event the driver intends to turn into our lane. When riding up a steep hill, we are not able to see traffic approaching from the other side of the crest of the hill. We will not know if the oncoming vehicles are encroaching in our lane until we reach the crest. As you get closer to the crest of the hill, move out of Position One and into Position Two and remain there until over the crest. Only when on the other side and visibility has increased should we return to our previous position. This will reduce the possibility of collision with oncoming traffic. In addition, it is advisable to roll off the throttle slightly when approaching the crest of the hill, while getting ready to cover the brakes in the event a sudden obstruction appears on the road beyond. This enables us to stop swiftly and safely. Always travel with the headlight on. Statistics show that visibility is increased when a moving motorcycle is showing a lit lamp. On the other hand, ensure your high beam is not on when facing oncoming vehicles. This can be a distraction causing other drivers frustration. Always check the brake lights before starting out. This will catch a burned out bulb and prevent us from becoming rear-ended if we need to brake suddenly. 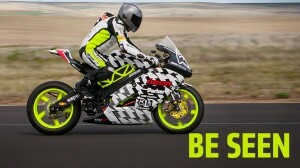 Remember, a motorcycle can stop much faster than a car, and the brake light is our only communication device. It is also helpful to apply the brakes softly to light the bulb, warning traffic of your intention before making a stop. One way to stop someone from tailgating is to flash the brake light. Hopefully the offending motorist will take notice and act accordingly. If they persist, however, slow down and create more space in front. If this continues, pull over and let them pass. An impatient motorist behind you is a hazard. One of the most important pieces of equipment on a motorcycle are the tires. The traction they provide keeps us upright. You need to know how they are affected by road and weather conditions. In Canada, we usually ride on roads that are paved with asphalt. In the United States, many interstate highways have concrete surfaces. Concrete provides slightly better traction than asphalt. You should, however, be aware of the hazards each poses. Concrete roads often contain grooves for water run-off. The grooves usually run to the side of the road although sometimes they run in the direction of travel and can make it difficult to steer if your tire gets caught in them. Concrete roads are poured in sections and if they become frozen, they shift upward and cause bumps at each union. This can make for unsteady handling at high speeds. Asphalt roads also buckle from frost. Often these cracks are filled with a material called ‘banding’. This material is identifiable by its shiny black paint-like appearance and is extremely slippery, either wet or dry. Banding presents a particular hazard in curves and all motorcyclists should use caution when riding over banding. Painted lines are either yellow or white in colour. They divide the lanes and mark crosswalks. Given their prevalence, you should know they can be very slippery, especially when wet. Use caution when turning at intersections or crossing them when passing or changing lanes. Note: This site is for information purposes only and is not meant to be construed as legal advice or motorcycle riding instruction. Circumstances concerning proper riding technique are subject to change with conditions and experience. Contact your local riding school for more information. Content provided by Motorcycle Lawyer.ca is not to be reproduced without authorization. Motorcycle Lawyer.ca is a pending trade mark and any unauthorized use of the name or likeness is prohibited.